Where is it ? About fifty Kilometres west of Faro Airport. Approximately 45 minutes by car. How big is it ? One of the Older resorts of the Algarve,Armacao de Pera only has about 3000 permanent inhabitants but numbers swell during the summer season. Who goes there ? The resort features a huge beach and lots of high-rise Apartment blocks. There are more family friendly resorts in the Algarve so really it is popular with beach natives. 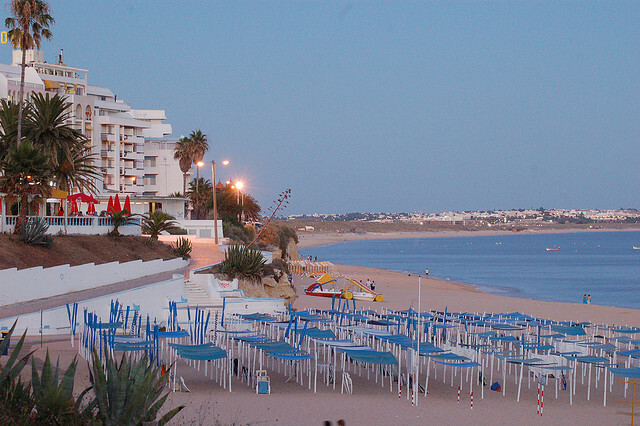 Armacao de Pera has always been a more popular resort for Portuguese tourists. What about food and Accommodation ? The resort is heavily built up with high-rise Apartment blocks so other than the peak of summer there is usually plenty of availability. There is a good selection of food and shopping in the resort. The Eastern part of town features the old village and is less commercialized. This part of the Algarve was once awash with Pirates and a day trip by boat up the coast will reveal a number of caves and coves dotted along the cliffs. There is a bus Terminal in the town and there are regular services to Albufeira and Portimao although a hire car would be a good option if you want to examine the rest of the Algarve. Being popular with Portuguese the resort has a less British or Irish feel than many other touristic places on the Algarve. The advantages of this are some excellent and friendly portuguese restaurants and prices are considerably lower than resorts like Albufeira.